The angry mullah picked up Guru Nanak’s feet and swung them around in the opposite direction—but then the Ka’aba swung around too. Whichever direction the astounded mullah turned Guru Nanak’s feet, the Ka’aba was there, facing his feet. My father explained to me that the point of the story is that God is everywhere, in every direction, in every space, without exception. This concept confused me, and I found myself wondering how God could be in the tank full of sewage in our neighborhood. That night I had a dream—the first that I recall—in which Guru Nanak, his long white beard rippling like a river of silk, arose from the scum of the sewage tank wearing a perfectly clean long white robe, took me in his arms, and cuddled up next to me in bed. It is a relationship that has had conflicts, quarrels, separations, sudden closeness, and long distances. During my period of rebellion, which lasted some twenty-five years, Guru Nanak seemed absent until suddenly, like an underground root that spreads and sprouts in another continent, he reappeared in 1989 while I was in the United States. It was four and a half years before a personal tragedy struck. It is a constant source of amazement to me that while on this Real Journey, our soul prepares for the direction the journey will take long before our conscious mind becomes aware of it. I recall the exact instance when Guru Nanak sprang alive in my consciousness again, just as if he had never been away those many years. It was shortly after my marriage to Donald Dean Powell. I was walking on the beach listening to some kirtan tapes I had picked up on a whim during a visit to India. At the first few holy sounds, my parched soul ignited into an unquenchable fire. The divine had entered through the portals of my ears. Though I grew up listening to kirtan on the radio and on phonograph records—both my parents were ardent fans—this felt entirely new. It riveted my heart, mind, and soul. My future direction was pouring its melody into my years. Henceforth, I bought and listened to shabads incessantly. It is a happy addiction to which I owe my life. At about the same time, a prayer I had heard in my youth began repeating itself in my head: “Taira phaana meetha lagai,” meaning “May your will be sweet.” Not “May thy will be done,” not “May I accept or resign myself to your will,” but “May your will be sweet.” My own interpretation of God’s will is the Cosmic will of the Unimultiverse—that which is and cannot be circumvented or reversed. I didn’t know then what I can see so clearly in retrospect: these seemingly sudden occurrences had been ripening all through my rebellious years. This spiritual growth was necessary preparation for death, for the end that we fear for ourselves and those we love, and which we need to remember in order to live consciously, with a passionate and ever-renewed attention to the inevitable passage of time and a commitment to life in all its aspects. In 1993, my then husband, Donald, committed suicide. When I called my father in India to tell him, his words to me after his initial shock and sorrow were “Take it lightly,” and “It is part of the design.” My father is (and continues to be, even after his death in 2007) my Third Guide, the one who brought me to the other two. The story of how my husband’s death taught me to live better, to love again, and to find sweetness in sadness, is a long one, perhaps never to be told in full, though a part of it was told in my book-length poem, As a Fountain in a Garden. Kirtan, music accompanied by the songs of the gurus, gave me a place to turn to when all my ways were lost. The music provided me with a space to inhabit where all is forever well, where nothing is lost. It gave the rivers of my tears an ocean to pour into. It gave meaning to my suffering and illumined my darkness. Though I grieved long and hard, it seemed my hand was held through this crisis, a hand that has never withdrawn itself since. Throughout these years, a strong chord has tied me to Guru Nanak, my Second Guide, whose words echoing in my ears have helped me steer through the turbulent waters of life. Guru Nanak unceasingly points his finger to the invisible and ever-present First Guide, the Adi, the primeval Purush, the One beyond dualities and the clashing swords of conflict; the Formless suffused through form, the Invisible manifest in the visible, the Mother-Father Energy of the universe, neither male nor female; a nondifferentiated Being, beyond human conception and Naming (yet responsive to the names we attribute to It), and as near to us as our heart, blood, and skin; the One who is the Axis on which the universe turns, the protoplasm that flows through every sentient creature, through every miniscule and petty detail of our lives and all the levels of who we are. Guru Nanak’s words, echoing in my ears, have been my holy guides. I am eclectic about spiritual wisdom, and glean it from all sources. 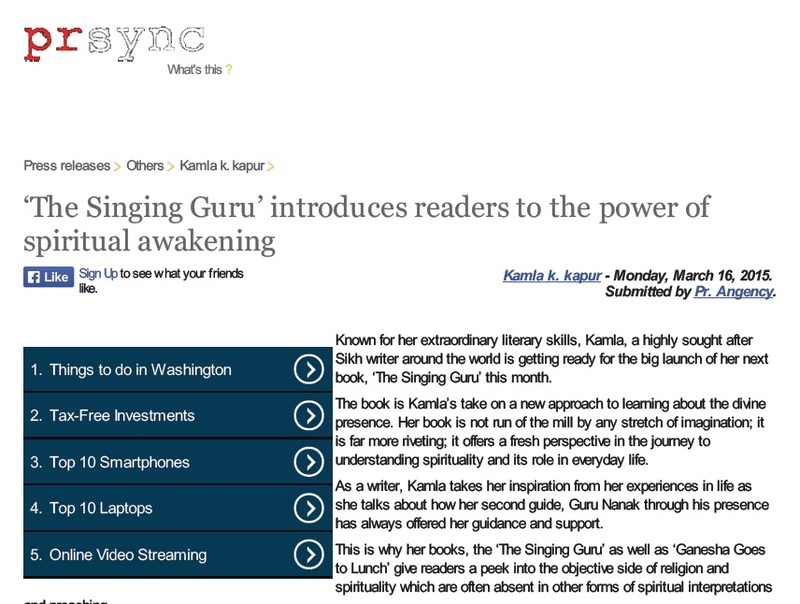 I have written two books from the Hindu and Muslim traditions: Ganesha Goes to Lunch (U.S.; now reprinted in India as Classics from Mystic India) and Rumi’s Tales from the Silk Road (U.S.; published in India as Pilgrimage to Paradise). This eclecticism and egalitarianism is an integral part of Sikhism. The Sri Guru Granth Sahib (SGGS), the Sikh holy book, contains the songs (called bani) of seven Sikh gurus, including Guru Nanak, who composed and sang; the songs of fifteen Hindu and Sufi saints, such as Jaidev, Ramanand, Farid, and Kabir; and the songs of six low-caste, “untouchable” saints (cobblers, butchers, barbers), such as Ravidas, Sain, and Sadhana. Guru Nanak’s definition of a religious person is “one who looks on all as equal.” Brotherhood and sisterhood of all on this planet is Sikhism’s basic tenet; music is at its heart; and the worship of words, akhar, naam, and shabad is at its very core. Guru Nanak’s (1469–1539) spiritual fire sparked the world’s youngest religion, Sikhism, which continued through nine succeeding incarnate gurus and established itself for all time with the compilation of the Eleventh Guru, the Sri Guru Granth Sahib. 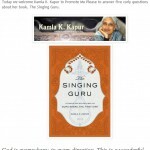 This holy book is revered as a Living Guru whose spirit is embodied in the Word. In his youth, Nanak was a wandering poet and minstrel who traveled to the far corners of India and beyond, all the way to the Middle East and China. At a time when a man was distinguished by his garb, Guru Nanak dressed theatrically, combining elements from Islamic and Hindu attire with something of his own, to challenge the preconceived notions of those he met along the way. He sang ecstatically of and to the Beloved Being, the One to whom, Nanak believes, all beings and inanimate creations in the material world sing. 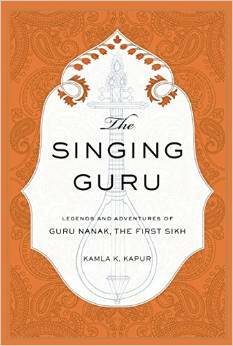 Nanak’s 974 extant songs, contained in the SGGS, evidence Nanak’s vision and experience of the nonsectarian Being, Akal Purakh, the Timeless One beyond gender. It is a vision that illumines the miracle of our presence on this planet and forces a reevaluation of our humdrum, comfortable lives. Nanak’s is an inspired marveling that conjures the Other, who is also ourselves, the One subject and object of our highest and most intense longings. Many other aspects of his multidimensional personality complemented Nanak’s mystical nature. He was a social critic, revolutionary, and iconoclast who reunited mankind with the forces of nature. He said of himself that he had no more caste or race than wind or fire; he blasted through the petty, parochial, limited, superstitious, and encrusted version of God, cut through the delusions and ignorance that separate humans from each other, saw through the skin of appearance to the light that informs every breathing thing, shattered the prescriptions and constrictions of rituals and idolatry, and sought at the source the transcendent and immanent energy infused through the micro- and macrocosm. Nanak’s is a personal, direct, and unmediated Way that places no barriers between the lover and the Beloved. In his songs, Nanak rends the perceptual veils that blind us to the truth that the Lord of the cosmos and the human heart are one. This oneness transcends all the stratifications of society. None of these abstract descriptions can encompass Guru Nanak’s totality. He inhabited all of himself. 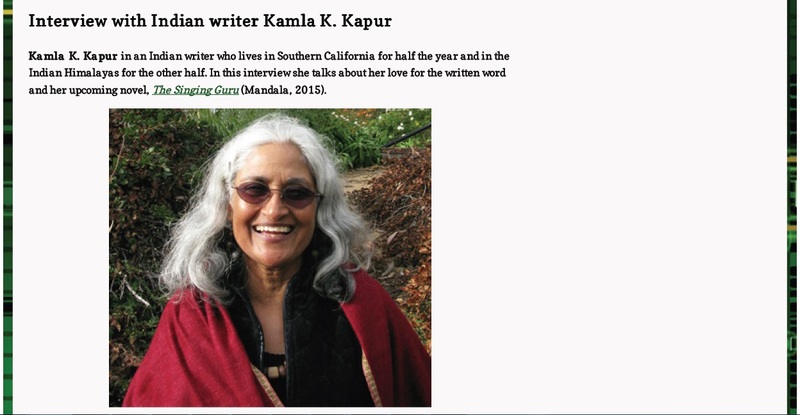 In addition to being a sage and guru, he was also a wanderer, poet, singer, adventurer, son, husband, father, and brother. Later in his life, when he settled down in a city he established—Kartarpur, the City of the Creator—he tilled the fields, sowed seeds, and harvested crops. He used these experiences to weave metaphors of cultivation into many of his songs. In Kartarpur he established the community that became the first followers of the religion we call Sikhism, a community that welcomed people from all walks of life, that ate together in a common kitchen, and worshipped the Essential God, not its fragmented images. Nanak’s message was clear: God had to be found within life through engagement, not withdrawal. A human has to play, and play well, the many roles that life demands. He believed fervently that Karta Purakh, the Creator and Experiencer, was similarly engaged in the drama of existence. Nanak refused nothing of life, but affirmed all of it: the mundane and the spiritual, the practical and philosophic, the human and divine. He was wedded to God and wife, ecstasy and the quotidian, at once earthbound and ecstatic. For him, the secular and the holy are on the same continuum. Soul and body, God and wife, song and plowing, contemplation and society, meditation and food—he lived a life of full relatedness on every level. However, Nanak never tires of reminding us that our engagement with all aspects of life has its essential counterpart in detachment; that worldliness and business without personal discipline and a turning to love and adoration of the One will doom a soul to torment. 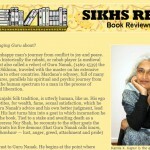 This book is not a history of Guru Nanak’s life. It is a fictional rendering that includes some of the legends, folktales, and myths that have sprung up around him. There are many of them, and I have had to be selective. 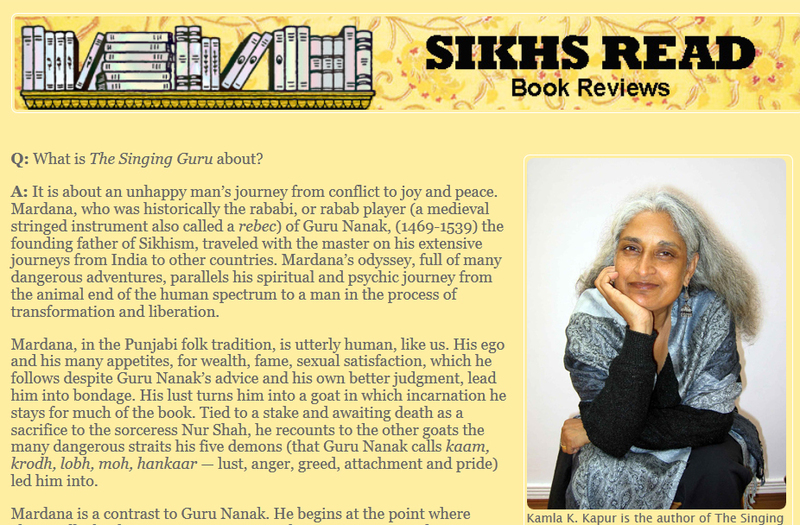 Nor does this book attempt to follow the chronology of the traditional and canonical version of Guru Nanak’s life. Narrative and thematic consistency guided me more than the factual timeline. 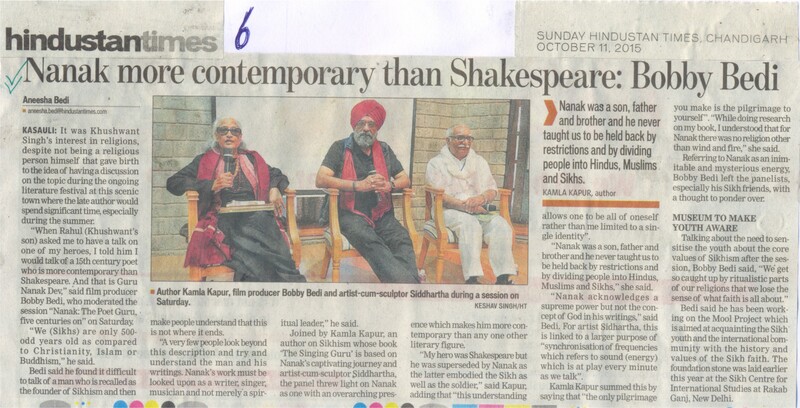 I followed the practice of chroniclers who wove a context around Guru Nanak’s words, though I have parted ways by reinventing the traditionally accepted contexts. 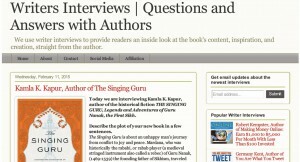 It became clear to me early on in the process of writing that I could not write the book from the point of view of Guru Nanak. In one’s smallness it is impossible to encompass, describe, envision, or recreate a being as spacious as he. Instead, I chose to view Nanak through the very human eyes of Mardana, his servant, accompanist on the rabab, disciple, and companion. 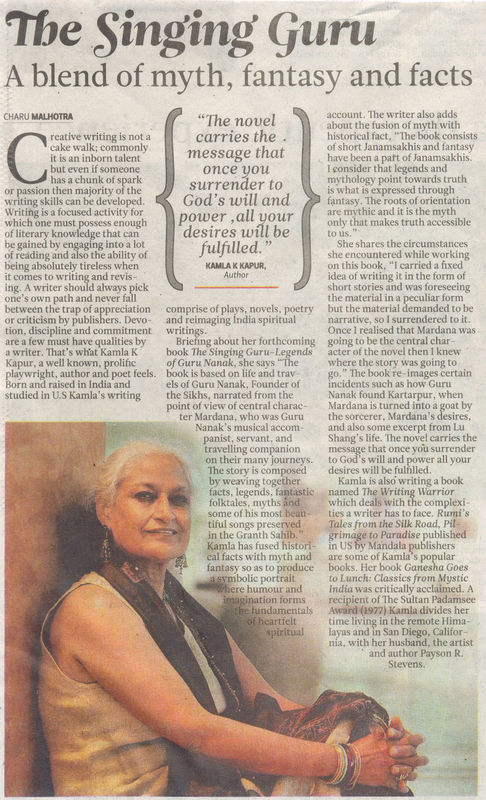 While growing up, I listened to stories about Mardana that were inter- woven with stories about Guru Nanak. In the Punjabi folk tradition, he is a Sancho Panza–like character at the animal end of the human spectrum. I have retained some of this, though in this book Mardana has evolved into a complex character with a seed of light that luminesces as he gets to the end of his life. Mardana, like the rest of us, is afflicted with vice, haunted by worries, fears, and desires, full of all sorts of hungers, and at the mercy of his untamed mind. He often makes conscious decisions to ignore Nanak’s advice. His appetites and many desires always get him into trouble. He is the image of the entrapped soul, bound with a chain and at the mercy of his cravings. The legends and stories of Guru Nanak’s life that I grew up with from the Janamsakhis were invariably skeletal. The two fragmentary stories that are the underpinning of this narrative include the time that Mardana became a goat and Guru Nanak rescued him, and the time that Mardana was given a bundle of things that weighed him down in his journeys. Guru Nanak asked him to throw the bundle away, which, according to the traditional version, Mardana obediently did. These stories are fantastical. Fantasy is part of human reality, not only as an escape hatch from the pressures of the real world, but also because of its power to illuminate reality and reveal metaphysical and psychological truths. Having been a fan of mythology all my life, I sympathize with the popular sentiment that gives wings to facts. Our magical heroes and sacred icons serve as reminders of who we can become. 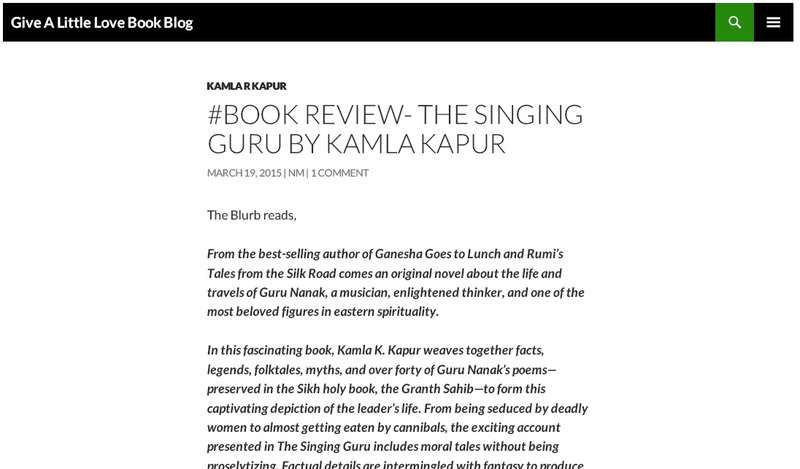 The story, though complete due to the necessity of an ending, is incomplete in the sense that the narratives of the succeeding nine Sikh gurus carry on through the generations for two more centuries. This is the first of a series of books. Nanak and Mardana will reappear in Book Two, along with their wives and children, who are barely mentioned in this volume. The main thrust of this book has been Guru Nanak and Mardana’s odyssey and the adventures and legends associated with it. Max Arthur Macauliffe, whose labor of love, after much research culled from many sources, produced six prodigious volumes titled The Sikh Religion: Its Gurus, Sacred Writings and Authors, and whose work has been the main source and inspiration for this and my subsequent books, starts his volumes with the following words: “I bring from the East what is practically an unknown religion.” Though his books were first published in 1909, Sikhism continues to be an unknown and misunderstood religion. Sikhs are often mistaken in the West for Muslim terrorists. 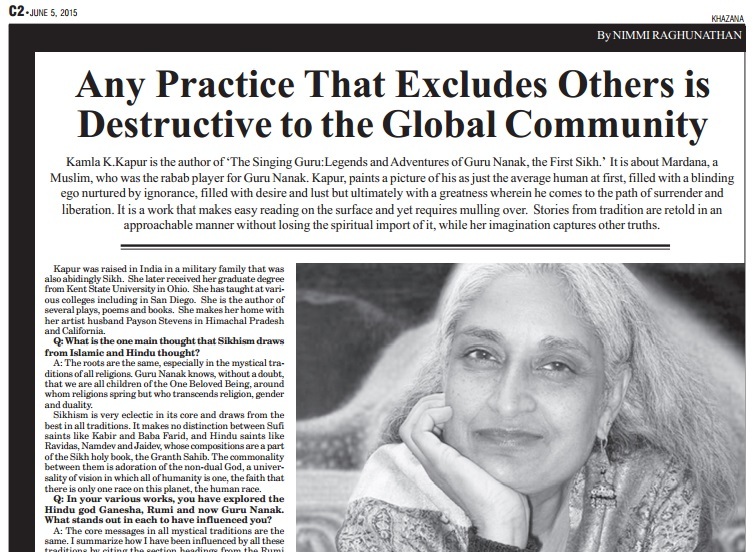 It is my humble hope that my work will contribute to an understanding of Sikhism and its founder, whose nondenominational approach to spirituality and joyous acceptance of all aspects of life is particularly relevant in today’s fragmented and conflicted world. 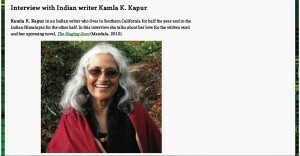 Kamla Kapur has created a Sikh parallel of Homer’s Odyssey in the re-imagining of its founder’s spiritual journey, cleverly recounted in the voice of a mercurial acolyte. As with that work, the prose melts into mellifluous poetry, music to the soul. In company with the Sikh spiritual leader, Guru Nanak, we travel from magical place to magical place throughout India and are reminded again and again of what values should inform our life. You wait until the saga is over to exhale and still wish there were more. A ripping read. 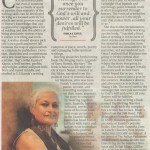 Kamla Kapur chooses an innovative and wondrous way of retelling the eternal truths contained in the life and teachings of Guru Nanak. 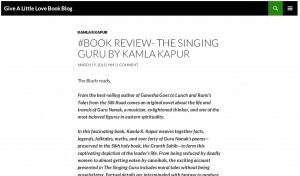 Her simple, melodious narrative depicts common human frailties and deep philosophical complexities with equal ease: The Singing Guru will delight the mind even as it enlightens the spirit. 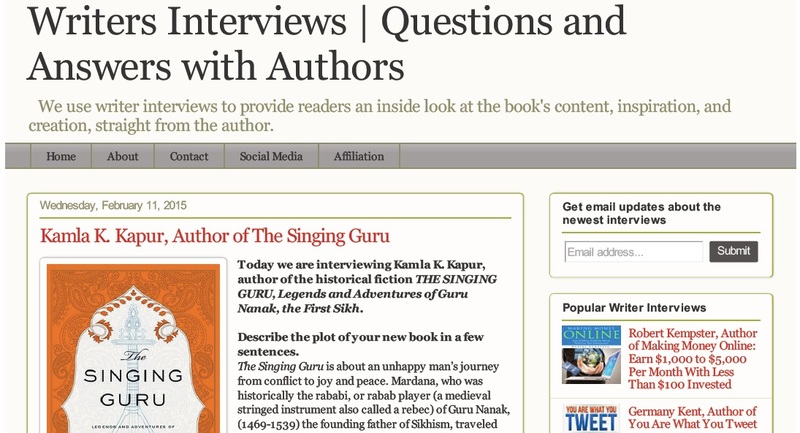 Navtej Sarna, author of The Book of Nanak and The Exile Rich imagination, anchored by the spirit of the Janamsakhi tradition, brings alive the story of Guru Nanak Dev, the founder of Sikhism. 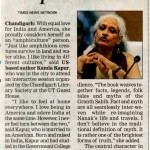 Kamla Kapur has written a gripping book in a style that is both simple and lucid. 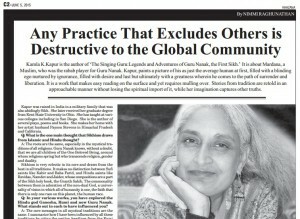 Her reinterpretation of the Janamsakhis should find wide resonance among readers. 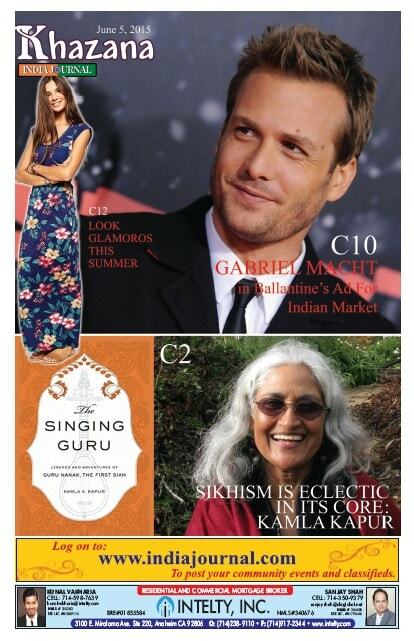 The Singing Guru is simply superb! 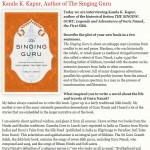 The Singing Guru is a fascinating reconstruction of the Purantan Janamsakhi tradition. I teach a course on South Asian Literary Cultures and a work like this would make an engaging text for students to read. 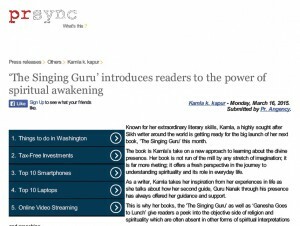 I am filled with utmost happiness in my heart going through The Singing Guru and discovering a way to enlightenment. 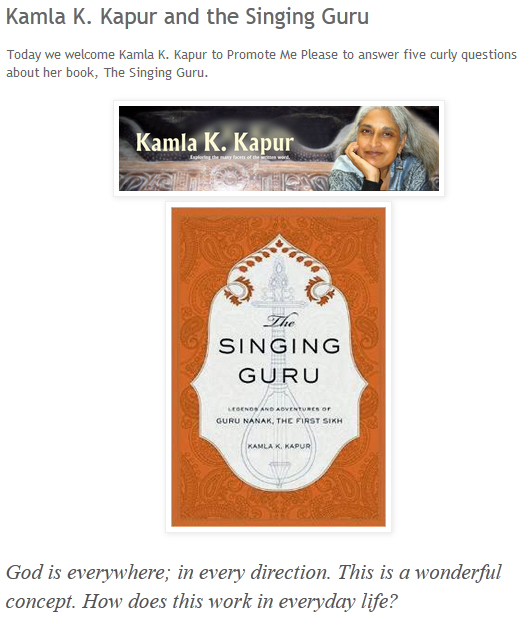 We can only imagine Guru Nanak singing 500 years ago and I congratulate the author on her wonderful, enthusiastic story and the underlying music that fills it. Hans Raj Hans, Punjabi Rock star and Sufi singer. 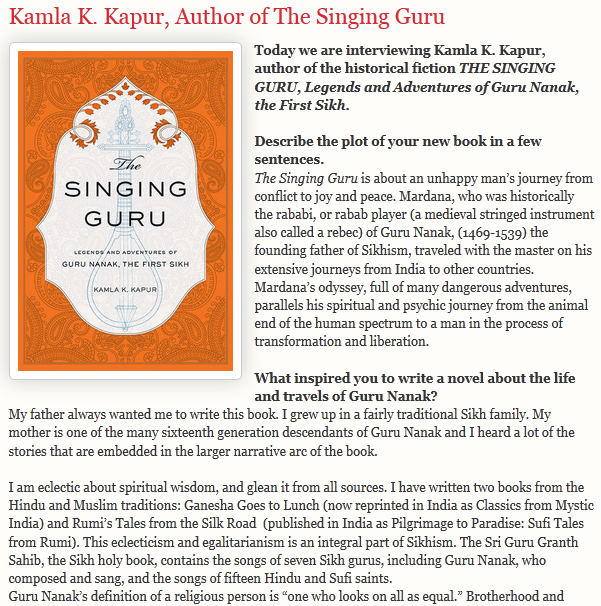 The Singing Guru is indeed a remarkable work of imagination through which Kamla Kapur brings alive the story of Guru Nanak in the voice of his lifelong companion Bhai Mardana. This retelling of Janam-sakhi narratives is breathtaking in scope, refreshingly innovative and written in accessible style. It will make an interesting read for both academic and popular audiences. The author deserves our compliments for her rare achievement. 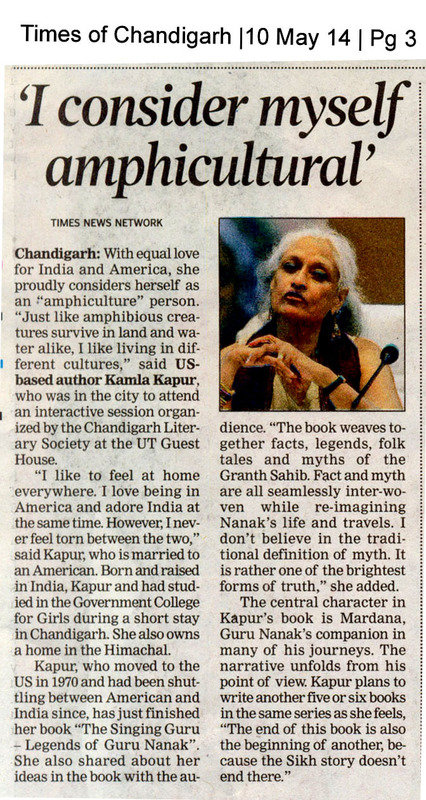 Kamla K. Kapur was an invited author at Khushwant Singh Literary Festival at Kasauli early November 2015. 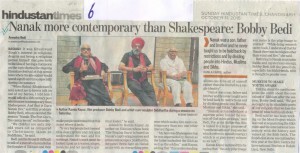 She spoke about Guru Nanak in the panel which had Mr Bedi and Mr Sidharth as co-panelists.